Welcome to the Ready to POP! [a Labor Day inspired Giveaway Hop] hosted by the Blogging Mamas Network! This year we're celebrating Labor Day in a totally fun way – by offering fabulous giveaways for Mamas and Babies who have done some of the hardest labor out there! 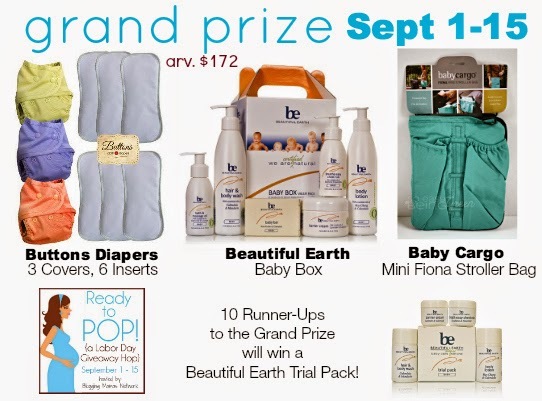 Each blogger in this Hop has a fabulous Mama or Baby prize for you to enter to win – so be sure to hop around to them all after you’ve entered to win the fabulous Grand Prize, featuring Buttons Diapers and Beautiful Earth! I am so excited to share Hip Baby Wrap with you!! Being a busy Mama, I am going to need a wonderful way to wear my baby, especially while I am homeschooling my other children. I have never really cared for the hard shell type of carriers, or the ones where I always feel that I need both hands to keep supporting baby. When I saw Hip Baby Wrap I knew it would be the perfect solution! Easy to follow directions included. The wrap will take some getting used to, but once you do it will become like second nature. I can't wait to try it out on our wee one due in November! So what makes Hip Baby Wrap so special? Enter to win a Hip Baby Wrap! Be sure to check out these other great blogs and their Ready to Pop Giveaways! So Easy Being Green, Viva Veltoro, the Blogging Mamas Network, and the Ready to POP! participating bloggers are not responsible for sponsors who do not fulfill prize obligations. I would choose "tropical" lovely color combination! I love the sky colored wrap. very great colors to choose from. My favorite is the Rocky Mountain print. I already have the rocky mountain and like it a lot. Love the ocean or sky color!! I love the rocky mountain color, even my husband would use that. I'd get Sky, it's gorgeous! I think I would pick "Sky". Gender neutral, but still bright and lovely! I would choose the Rocky Mountain! I live close to them, but also love the colors! I like the Rocky Mountain print. the ocean is my favorite print, followed by the tropical. I like the ocean wrap. I would choose the jungle wrap! I would choose either Rocky Mountain or Sky! My favourite is Tropical, I'm addicted to pink. I love the Jungle print! If I won I would choose the Tropical print for my expectant daughter. I love the ocean print for my baby girl. Print is beautiful! Jungle or rocky my can't decide both fab . I would love the Rocky Mountain print. I love the Rocky Mountain one! I would probably go with Rocky Mountain cause it's very neutral and would match a variety of colors. But I love Tropical and Ocean! Sky!!!!! I love the colors. I would choose the sky color! I love the tropical print! I love the rocky mountain print, it's so pretty! Wow, if I had to pick one color I would say Desert, next probably Ocean. I've been very curious about these wraps and would love to try one! I wrap both my baby and toddler and would love to test one out!! I like the jungle print. I would choose sky because I would be gifting this to a friend who doesn't know yet what she is having! I like the Rocky Mountain. I'd love the sky print! I love the sky print! I haven't decided between rocky mountain and jungle. I love the Ocean one. They are all beautiful but I like JUNGLE the best! Ohh The Rocky Mountain for sure!! I once the ocean print! I like the ocean print. I would choose the Jungle color combination. I would choose the ocean wrap. I would choose Rocky Mountain. I would choose tropical. I love the combination of colors in it! I'd love to have the sky print!